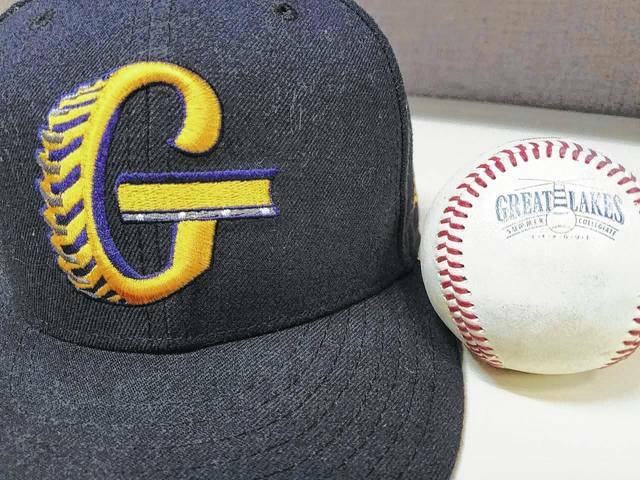 GALION —In a rare Sunday afternoon contest, the Galion Graders welcomed the Lake Erie Monarchs to Heddleson Field in Heise Park to clash in the 2018 Great Lakes Summer Collegiate League season finale. Neither team qualified for playoff action and Galion was playing for the chance to tie their franchise-best season record of 19-22. Having lost five straight games heading into the finale while failing to put up a lot of runs on the scoreboard, Galion would see their bats come alive as they successfully concluded their season with a victory over the visiting Lake Erie squad; 13-4. Both teams would get on the board in the first inning with the home team’s run coming after an one-out triple from slugger Jacob Reimold put him in scoring position before Juan De La Cruz delivered him home on one of his four singles on the day. Not much action from either squad in the second or the Monarchs in the top of the third. With the score still knotted at one apiece, Galion got their portion of the third started with a lead-off walk drawn by Eric Wentz. Reimold would smack another hit, this time a single and the Graders had runners on the corners. Juan drove Wentz in on a long sacrifice flyout to put the home team up narrowly after three; 2-1. Not to be outdone, Lake Erie would plate a runner in the top of the fourth to once again bring the contest to a tie. Galion would not have an answer in the home half. The Monarchs would manage to get two additional runs across in the top of the fifth to take their second lead of the game, this time at 4-2. Unfortunately for the Monarchs, this time the Graders would have an answer to their offense. The bottom of the fifth began with Reimold ripping a double to start the rally, followed by Juan’s second single of the game. With runners on the corners and nobody out, a wild pitch would be the route in which Reimold would score, putting Galion within a run, Juan at second and still nobody out. Todd Sekowski would walk after Juan made his way over to third on yet another wild pitch. Sekowski would not stay at first long and proceeded to swipe second for his 14th stolen base of the summer. Matthew Detering stepped in with two runners in scoring position and nobody out and would clear the bases with a single to put Galion back in front. A Vince Donato single and an Austin Hathaway walk would load the bases with Lake Erie still not having recorded an out. Christopher Jordan would keep the offense rolling along, scoring Detering with a single. Austin Harper would strike out for the first out of the inning with the bases juiced to send up Wentz. Wentz would get aboard the bases thanks to an error in the field by the Monarchs first baseman while Donato and Hathaway crossed the plate. Reimold, only needing a home run for the cycle, drove the ball deep before it was snagged near the fence but it would go into the books as a sacrifice fly as Jordan came across and Wentz advanced to third with two outs. Juan recorded his third single, second of the inning, and another RBI by plating Wentz before Sekowski struck out to halt the rally. In that bottom of the fifth, Galion sent 12 batters to the plate, knocked six hits to plate eight runs and found themselves up big at a tally of 10-4. A quiet sixth and seventh inning for both teams sent Lake Erie up to bat, down to just their final six outs of the summer and trailing by six runs. The Monarchs would be shutdown by Galion relievers Preston Stanley and Jordan throughout the remainder of the contest though. In the bottom of the eighth, already up 10-4, the Graders proved that their were not ready for the season to end just yet. Reimold would once again lead-off an inning with a hit, another single before being moved over on Juan’s fourth single of the day. Similar to the fifth inning, a wild pitch by the Monarchs moved both Reimold and De La Cruz into scoring position. Sekowski would flyout for the first out of the inning before Detering would belt a sac fly to right to score Reimold. Donato smacked another single and the Graders had runners at the corners with two outs. Hathaway would proceed to draw another walk and the bases were once again loaded. Jordan stepped into the batter’s box and delivered in a big way, dropping a bloop double into right field that scored both De La Cruz and Donato to give Galion the 13-4 lead, which would be the final score of the 41st game of the summer for the hosting Graders. Jose De La Cruz was the starter for the Galion squad, working the first 4⅓ innings of the ballgame while giving up five hits, four earned runs, walking five and striking out a pair. Stanley came in and worked the next four innings, picking up the win and giving up just three hits while walking two and fanning six Monarchs hitters. Jordan pitched the remainder of the game and recorded a strike out. Offensively, Lake Erie scored their four runs on hits but stranded 13 runners on the base path throughout the game. Galion posted their 13 runs on 15 hits while stranding eighth. Both teams committed one error on defense. Statistics for the Graders at the dish were: Team- 15/35, 12-1B, 2-2B, 3B; 13R, 10RBI, 2SB, 8LOB, 5BB, 6K; Reimold- 2-1B, 2B, 3B, 3R, RBI, SB; Juan- 4-1B, 2R, 3RBI; Detering- 2-1B, R, 3RBI; Jordan- 1B, 2B, R, 3RBI; Donato- 2-1B, 2R; Hathaway- 1B, R; Sekowski- R, SB and Wentz- 2R.